This Is Modern Art (based on true events) is a provocative play intended for a "young adult" audience that raises philosophical and political questions that are already generating heated discussions among theatergoers of all ages. 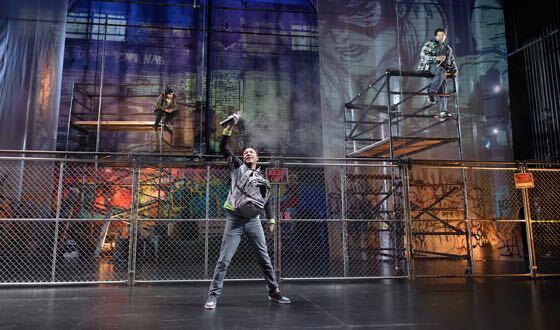 Steppenwolf's new production, written by Idris Goodwin and Kevin Coval, tells the story of a crew of graffiti writers who take a big leap and create a "piece" that grabs the attention of the whole city. Two actors stand out in the cast because of the energy and naturalism of their performances. Jerry Mackinnon plays Seven, the smart, charismatic leader of the MUL (Made You Look) crew, and J. Salome Martinez Jr. plays JC, the spiritual, introspective member of the crew. JC delivers a powerfully poetic monologue about his love for the city and for the graffers that glorify it with their art. Finally, he says, "I climb steps to the roof and take in the skyline, Hancock to Sears, the city's lit crooked smile. It is so quiet. I come here to compose my self and when there are no stars, I am comforted by the stars man made. [Beat.] I think I need to hang a star of my own." The capable cast also includes Kelly O'Sullivan as Selena, Seven's girlfriend and the lookout for the team. Jessie D. Prez plays Dose, the third member of MUL. The MUL crew carries out their plan and creates their piece, a colorful mural defining modern art in their terms. It gains brief media attention and an immediate attack by the city's graffiti removal team. Because they fear arrest, the crew disperses. In the final scene, a replica of the "This Is Modern Art" wall is rolled down. The 85-minute play breaks the fourth wall now and then to tell the history and explain the vagaries of graffiti writing, which involves a lot of "graffer" jargon. Chicago has a long history of graffiti writing in public places, both the illegal variety and that done on "permission walls." From expressways and railroad underpasses to abandoned buildings, graffiti writing is a colorful, vibrant part of urban life. Brian Sidney Bembridge's set for This Is Modern Art is made up of piped scaffolding on which the writers climb to write their art, a painted backdrop and a translucent curtain. The set is full of little details. A pair of shoes, tied together by their laces, hangs from pipes above the stage. Each of the various pieces of graffiti that adorn the backdrop and curtains have meaning, if you take the time to look them over carefully. During a talkback after the opening performance, one person questioned whether the play sends the wrong message to young people about the illegal act of graffiti writing. Several other audience members spoke out forcefully about why they did not agree. The Steppenwolf playbill asks a similar question: Was what happened an act of vandalism or important artistic commentary? The question deserves to be addressed. The script and the characters acknowledge that they are committing an illegal act. But the important message the play articulates is that art shouldn't be confined to elite galleries and museums with $18 admission tickets. The graffiti writers are artists shouting to be seen and heard. They demand visibility in a society that decrees them invisible--as artists and as individuals. The writers are playwright and hiphop artist Idris Goodwin and "Louder Than a Bomb" founder Kevin Coval. 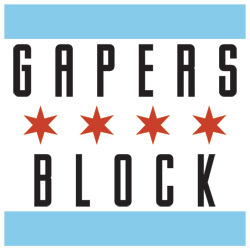 They have written a pointed and eloquent script that is already generating controversy in Chicago theater and education circles. And that's a good thing. This Is Modern Art runs through March 14, but there are only four more public performances: the next two Fridays and Saturdays at 7:30 pm. 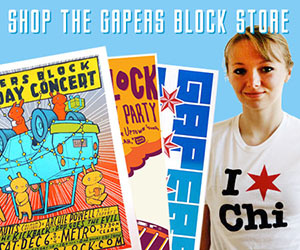 Tickets are $20 and can be purchased online or by calling 312-335-1650. School group performances will be offered at 10am Tuesday through Friday. For school group tickets, contact Lauren Sivak at 312-654-5643. James Brod, a junior at Guerin College Prep in River Grove, contributed to this article. Finally, someone who reviewed the play and GOT IT! I have a difficult time taking Kevin Coval’s viewpoint on the position of graffiti seriously. Mr. Coval grew up in a predominantly Jewish area of Northbrook. He attended private colleges without taking out student loans. And once his parents pass he will inherit their estate, which is, valued to be at least 1.2 million dollars just based on their North Shore home. He will know nothing of the lasting effects of graffiti in Chicago’s communities. does not have school aged children. When he does I am sure he’ll pack it up for the suburbs in no time flat. And the white suburban transplants who are applauding street art are no different. They move to Chicago for a handful of years and inevitably leave for areas outside the city after marrying and settling down. They have no permanent financial ties to the neighborhoods plagued with graffiti and are little affected by the long-term effects of decreasing property values that accompany it. To them this graffiti is something cool to post to their Instagram to show how edgy their neighborhood is. As a life long resident of the South Side I find Mr. Coval’s opinion as naive. He champions the benefits this type of expressions provides these vandals ignoring the fact that its the families and community of these taggers who lose value and wealth in their homes and the increasing taxes they pay to have it removed. Graffiti accomplishes nothing but eroding the nominal gains in savings and net worth the working families in the South Side work hard for. But for people like Mr Coval that's not really an issue because he's just a long term tourist in Chicago.